Hobart Brickie cornerback senior picture at the goal post. Jacob plays cornerback for the Hobart Brickies so without a doubt we'd be visiting the Brickyard Stadium for senior pictures. One of my favorite shots of the session is the above sunburst image just below the goal post. With helmet in hand, Jacob looked like he was ready to defend. One of the images he asked for was a raising of the helmet toward the scoreboard. I was happy to oblige, along with some portraits of him in his jersey. 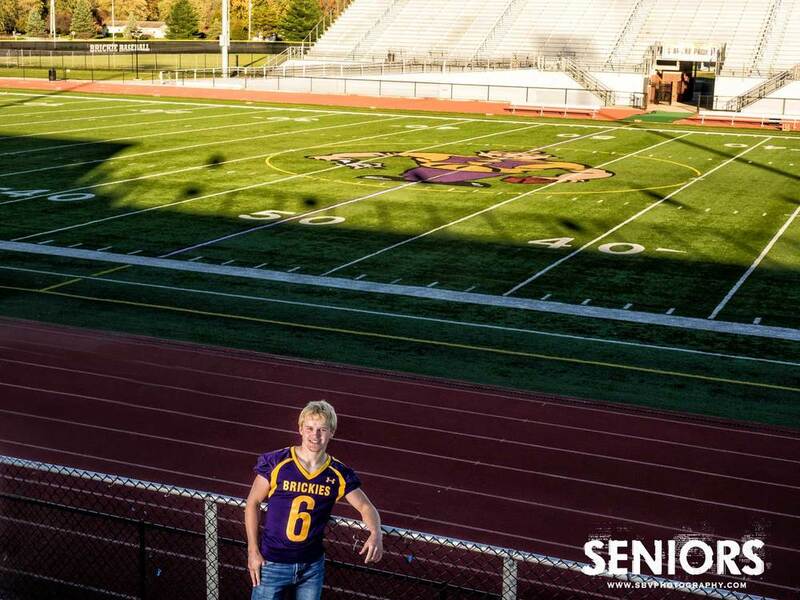 A Hobart Brickie high school senior on the field for senior pictures. A Hobart High School senior picture at the Brickyard Stadium. After the football themed photos it was off to downtown Hobart for some casual senior pictures along the boardwalk of Lake George. Hobart high school senior along the boardwalk of Lake George. A high school senior relaxes on the rocks along Lake George in Hobart, Indiana. This is merely a sneak peek look at Jacob's football themed senior pictures with many more to come.